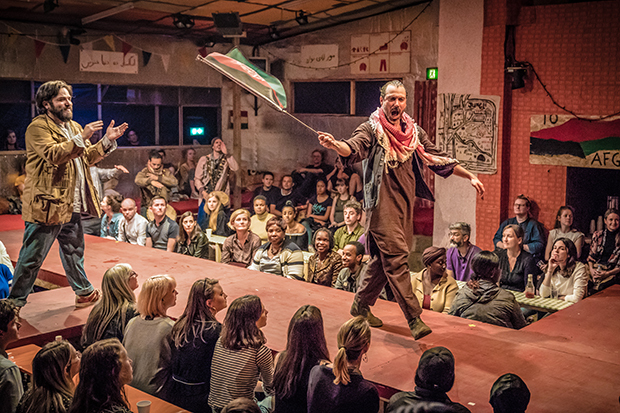 You’d be forgiven for expecting The Jungle, Good Chance Theatre's immersive play about the Calais refugee camp, to be a bleak and miserable affair. Inspired by real people and events from within the encampment and interspersed with all-too-familiar news footage, it’s a truthful account. Yet the show teems with humour, hijinks, humanity and hope. Playhouse Theatre has been cleared of Stalls seats and transformed into the Afghan Café which formed the heart of the migrant community. The audience sits on benches, around tables and against cushions as the action unfurls all around. Migrants from Sudan, Afghanistan, Eritrea (and many more besides) share space with a motley crew of UK volunteers. Together we drink chai, share bread, clap along to songs, dodge spilt beer and feel the wind as a mob of youngsters sprint by. Direction by Stephen Daldry and Justin Martin ensures that the audience is part of the community and there’s a closeness to the action that is at times cosy and inclusive, and at others claustrophobic. Following a commission by the National Theatre, the play evolved out of workshopping with actors as well as refugees who had been through the hell of the Calais encampment. Every character is fully-formed and unforgettable. There’s the defiant and charismatic Afghan chef Salar (Ben Turner) who refuses to move his restaurant for the police; there is Sudanese teen Okot (John Pfumojena), broken from dying so many different deaths; there’s light relief from teetering, inebriated Geordie Boxer (Trevor Fox) as a volunteer running from problems of his own. They sing, they hug, they laugh, they curse and they fight, never feeling sanitised, but real and relatable. Miriam Buether’s set design is a sight to behold, from the ramshackle fabric hangings strewn with fairy lights to the collection of coloured tents gently lit from within. Television sets positioned around the space flicker with harrowing real-life news footage, making it impossible to forget this is present, not fiction. Post-show in the theatre’s foyer, collection buckets fill up with donations for refugee aid. There are still around 700 migrants residing in hopeless conditions in the Calais camps, two years after the original ‘jungle’ was razed. Thanks to the work of charities like Help Refugees and galvanising, eye-opening shows such as The Jungle, there is hope that the plight of today’s refugees won’t fade from the UK’s consciousness.